There is a saying in Telugu which transilterates to 'puli ni chusi nakka vaatha pettukunnattu'. It means, a fox burnt parts of its skin, on seeing a tiger, in order to get stripes on its body. Obviously, the fox was trying to imitate the tiger here and hence thought that having those stripes will give it the qualities of a tiger. This simple saying captures pitfalls of a common phenomenon, argument by examples and analogies. It looks obvious and sounds like minimum common sense to not do mistakes like the fox above but we tend to do this more often. If you visit a country and observe that teachers there teach using a new method called, inquiry based learning or that they have uniform curriculum throughout the country, it is natural tendency for some to think that these should also be implemented in our country. However, the fundamental question is, why is it that inquiry based learning came to action in that country and not in ours? What are the underlying principles behind the functioning of such mechanism. Same is the case with the example of uniform textbooks and curriculum. It might turn out that either the underlying principles are something very different or that the observed phenomenon has nothing to do with the outcomes, for examples, stripes in the case of a tiger. Tiger is not ferocious because it has stripes! There are three issues with such arguments by examples. One, by arguing merely with examples, you can prove either wise, by cherry picking examples, depending on your objective, You only need to have enough knowledge to be able to use them as per the situation. Two, such simplistic insights derived from examples can do more harm than good. It diverts our attention to non fruitful issues, occupying the precious scarce bandwidth of policy discourse. Three, actions based on such ideas can give an illusion that something happening but nothing changing in reality. The opportunity costs of doing this may be huge. This phenomenon is called by different names by different people. Lant Pritchett calls it isomorphic mimicry. Arvind Subramanian in his recent article argues something similar saying, it is not that manufacturing sector is important, but what are the underlying principles which makes that sector important? What should be done then? Should we stop trying to get insights from examples? All our life, we are learning by looking at examples, should we stop that? Even if we are to stop deducing simplistically from examples and try to know the underlying mechanism, how can we do that? It is true that most of our life, we derive insights from examples and looking at examples isn't a bad thing but one must cautious while doing so. This blog proposes a framework to derive insights from examples, which of course needn't be fool proof, but can still structure the thought process and help us explore deeper. Let us take the example of uniform curriculum. We are interested to know if we should have a uniform curriculum in our country, based on experience from others. It is useful to construct a 2 x 2 matrix or a graph with four quadrants as below. On X- axis, you have the success metric, defined as per the context. In case of educational systems, it can be learning outcomes. In case of the fox-tiger example, it can be the ferocity. On Y- axis, you have the extent of the presence of the instrument of observation - inquiry based learning, uniform curriculum. In cases, where this is binary - presence or stripes or absence of stripes, the graph can reduced to a 2 x 2 matrix but let us keep this graph for this example. If uniform curriculum (UC) is present in green dots but not in blue dots, then probably this can be a first principle. If UT is present in green dots and blue dots, check if the policy of UC is being enforced properly in blue dots. May be it's due to a bad implementation of the policy. If it is being enforced properly, then may be UC is addressing a particular constraint in green dots which isn't present in blue dots. Hence, it isn't being of much use in blue dots. If it is present in green dots but not in orange dots, then may be there is an underlying mechanism behind UC, which is being manifested in a different form in the orange dots. 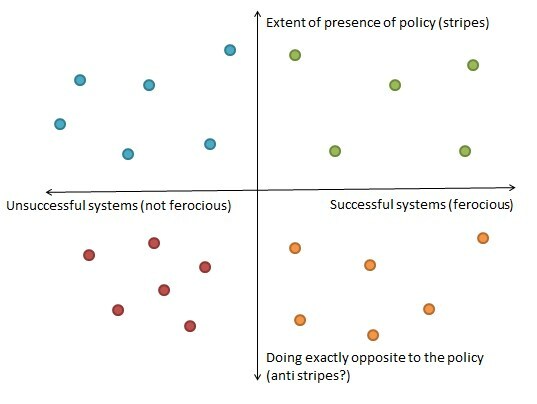 Try to find out the underlying principle behind UC and see if any of these are being manifested in other policies of orange dots. 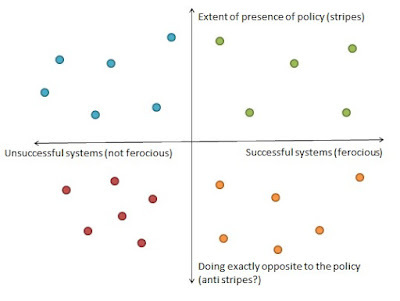 After finding out this underlying principle, see if it is manifested through any policy in red dots. If it is not, then the red dots are suffering due to lack of that policy. Analysis through this framework is not a substitute to quantitative analysis but it can be useful to quick cross checks and in cases where there aren't enough number of data points.